Rovers strolled to victory tonight. 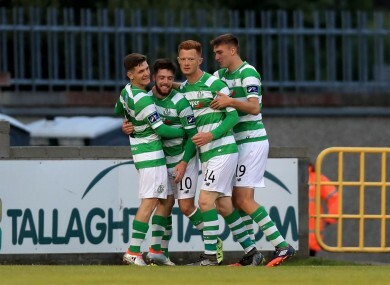 SECOND-HALF GOALS from Sean Boyd and Dean Clarke gave Shamrock Rovers a comfortable win on a night when Harps stretched their goal famine out to 471 minutes. Harps have not scored since Sean Houston’s match winner against Galway on 8 July and the worry here, again, was that chances were few and far between for the stuttering Donegal side. They fell behind nine minutes into the second half when Boyd rammed an unstoppable effort past Richard Brush from eight yards. The opening was carved by the magical footwork of Brandon Miele, whose close control and trickery made the opening and Boyd made no mistake, firing home for a goal that brought a familiar air of inevitability floating in from the Finn. Boyd turned provider in the 79th minute when he played Clarke, a substitute, through and he applied a fine finish across Brush. Boyd, who had an excellent second half, was buzzing and he got around Brush late in the night but a dangerous ball across had no takers while Boyd went close previously, curling over after getting past Adam Hanlon. Harps’ best chance of the second half fell to the returning Gareth Harkin, who shot into the arms of Rovers goalkeeper Craig Hyland in the 65th minute. Finn Harps: Richard Brush; Ethan Boyle, Keith Cowan, Packie Mailey, Ciaran Coll; Michael Funston (Adam Hanlon 73), Sean Houston, Barry Molloy (Ryan Curran 73), Gareth Harkin; Tony McNamee (Kevin McHugh 83); Ruairi Keating. Shamrock Rovers: Craig Hyland; Simon Madden, Rob Cornwall, David O’Connor, Shane Hanney; Gary McCabe (Stephen McPhail 71), Brandon Miele (Killian Brennan 75), Pat Cregg, Trevor Clarke; Gary Shaw (Dean Clarke 71), Sean Boyd. Email “Finn Harps' goal famine stretches to 471 minutes with defeat to Shamrock Rovers”. Feedback on “Finn Harps' goal famine stretches to 471 minutes with defeat to Shamrock Rovers”.